Jade is actually two separate gems: nephrite and jadeite. In China, a pierced jade disc is a symbol of heaven. 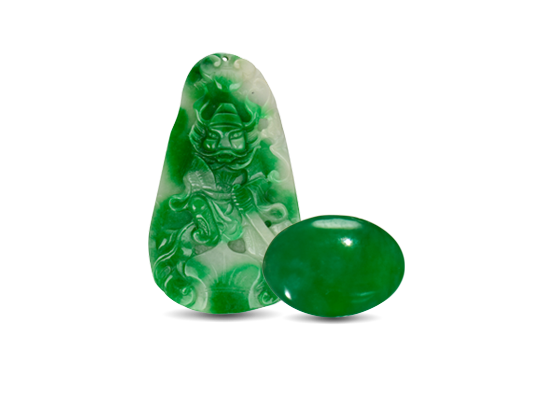 Jade is desired for its rich heritage as much as by its beauty, durability and rarity. This carving makes use of jade’s intense green and white mottled areas. The boulder is sawn to view its inner colour. 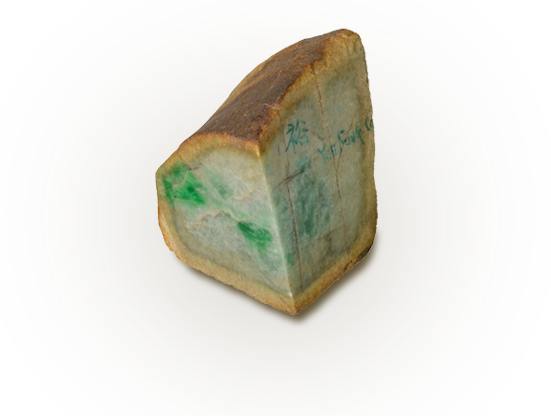 This 1041-gram jadeite boulder is sawn and marked for further cutting. Jade has its cultural roots in the smoke-dimmed caves and huts that sheltered prehistoric humans. Around the world, Stone Age workers shaped this toughest of gems into weapons, tools, ornaments and ritual objects. Their carvings invoked the powers of heaven and earth and mystic forces of life and death. Jade is the official gem for the 12th anniversary. The philosopher wrote that jade is like virtue and its brightness represents heaven. The traditional jade flat disc with a hole in the middle, known as a “bi”, symbolises heaven. The character for jade is one of the oldest in written Chinese, dating to 2950 BC. There are a number of processes used to alter the colour or apparent clarity, or to improve the durability of gems. Some gemstones have synthetic counterparts that have essentially the same chemical, physical and optical properties, but are grown by man in a laboratory. Any gem can be imitated – sometimes by man-made materials or by natural materials chosen by man to impersonate a particular gem. Jadeite’s structure scatters light. If properly cut, a white piece with a small green spot will make the gem appear completely green if lit from behind. Not unusually hard for a gem, both jade types are extremely tough. Neolithic knives and axe heads were often made of nephrite. Nephrite rings musically when struck. The Imperial Court in China had jade wind chimes designed to ring specific notes. For both jadeite and nephrite, green is the most valued colour. Semi-transparent clarity and fine texture also increase jade’s value dramatically. 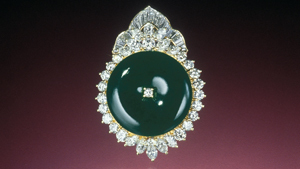 The finest jadeite – almost transparent with a vibrant emerald-green colour – is known as “imperial jade”. Jadeite’s transparency ranges from completely opaque to semi-transparent. The best jadeite is semi-transparent. Jadeite has a lovely, smooth and even texture that makes people want to touch and hold the gem. While jade is rarely faceted like other gems, plain as well as intricate jade carvings are judged by their artistry. Jadeite is generally sold by the piece rather than by weight. For top-quality imperial jadeite, slight size differences can make large value differences. Explore sources, gemmological research and the role of gems in history. Found in lava, meteorites and deep in the earth’s mantle, yellow-green peridot is the extreme gem. Dazzling brilliance. Captivating colour. These are the planet’s most valued gems.